Beauty and the Beast is a traditional fairy tale. Its first published version was written by French author Gabrielle-Suzanne Barbot de Villeneuve in the middle 18th century. It was a novel-length story intended for adult readers and addressing the issues of the marriage system of the day in which women had no right to choose their husband or to refuse to marry. The best-known version of the tale appeared sixteen years later. Jeanne-Marie Le Prince de Beaumont simplified and shortened the Villeneuve’s work and published it in a magazine for young ladies. The new abridged version became more successful, and Madame de Beaumont is regarded now as the author of the classic story. What better way to kick off A Week of Beauty and the Beast in honor of the upcoming release of Disney’s live action version of the story than to start at the very beginning with the 18th Century original tale? I’ve lived my life loving the animated Disney movie, so I was excited to read the story that inspired it all. 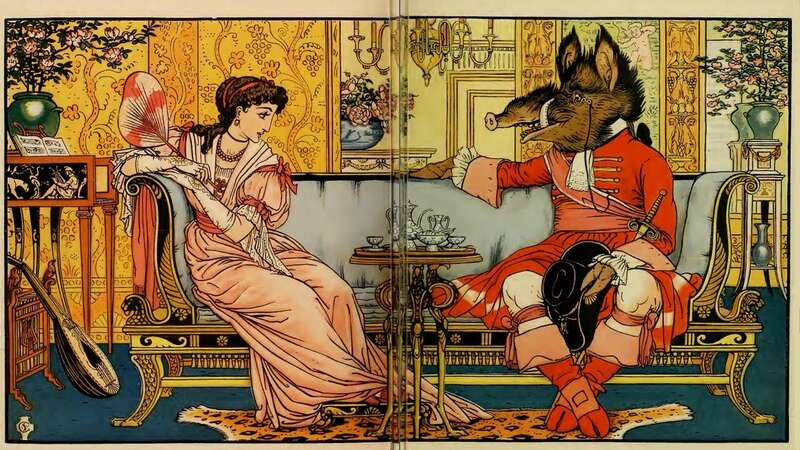 My copy of this story is illustrated by Walter Crane, and it looks like an illuminated manuscript. Each page of text is framed by roses and leaves, and the periodic full-page illustrations are very detailed. This version, while different from the Disney movie we all love, is still quite magical. Beauty’s father has lost everything he has to pirates. One day he learns that one of his ships has been recovered and journeys to town to claim what’s rightfully his. Before he leaves he asks each of his daughters what they would like him to bring back for them. All Beauty wants is a rose. So, father sets out on his journey only to find that his partners have divvied up all his possessions because they thought he was dead. He heads back home, depressed, defeated, and even more broke than he was before he left. He presses on through the cold, winter night and falls ill. He ends up in the beast’s castle, where he is nursed back to health. As he leaves the castle for home, he picks a single rose for Beauty. This makes the beast very mad and he tells the old man that unless one of his daughters volunteers to live in the castle forever, the beast will kill him. When father returns home, of course Beauty volunteers because it was her silly request of a rose that got her father into trouble in the first place. Beauty lives with the beast and dreams of a handsome prince each night, who tells her to look past outside appearances and save him from his plight. Each day the beast proclaims his love for her and proposes marriage. For some reason, Beauty cannot make the connection and is convinced that a handsome prince is imprisoned somewhere in the castle. Oh, he is… He just might not be where she expects to find him. Looking past outward appearances is a very common theme throughout this book, and I find it to be a timely message given today’s expectations of what a person must look like in order to be worthwhile or successful or loved. However, it does bother me that there’s a double standard. Beauty is noted as being beautiful–the most beautiful person in her family. The beast falls in love with her, but we are led to believe it’s because she’s beautiful. We’re basically being told here that women should look past outward appearances and love unattractive men, but men can still require the highest of standards. Of course, this story was written in the 1750s. We’ve come a long way since then, but there is still this “women must look like this” stipulation today that I hope dies out with other things from the 1750’s. Like Smallpox. And dying of pneumonia. The writing is very antiquated and simplistic, but I loved reading the original story and comparing it to all the versions I’ve read and seen since then! I highly suggest you snag the free ebook and give this a read if you’re a fan of today’s Beauty and the Beast. 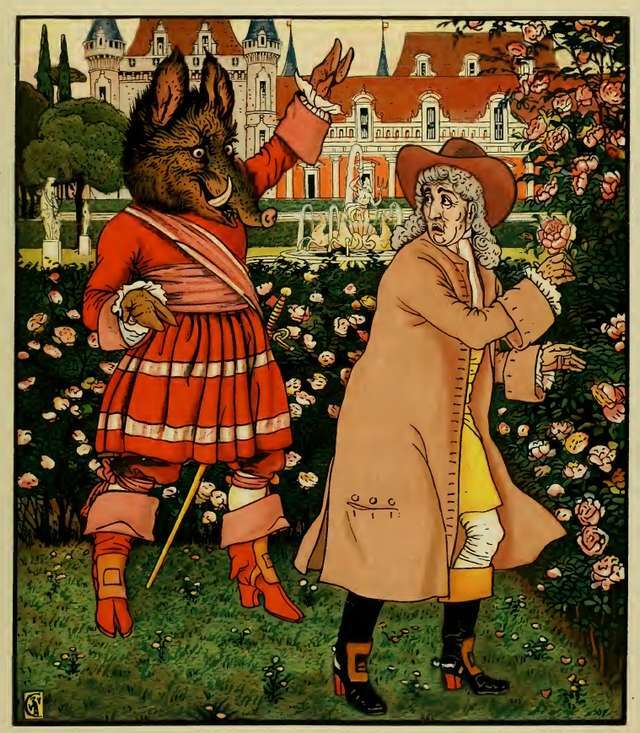 Strangely, de Beaumont’s version of Beauty and the Beast is included in a collection of Charles Perrault fairy tales I have. I haven’t read it yet, but it’s my plan to, eventually, do a comparison post looking at various retellings of the story, and include the originals, too. I also want to get hold of de Villeneuve’s story for adults, as that’s where I consider the story to originate. It’s funny about the double standard, but unsurprising. It’ll be interested to see how this aspect of the story is dealt with, if at all, in other versions. Great review!